These have the negative space “weeded” out so whatever surface you stick them to it will show through the decal. Not to be confused with DIE-CUT stickers, VINYL CUT decals are single or multi color, 5-7 yrs outdoor vinyl. Works great for window SHOP HOURS, VEHICLE LOGOS for CONSTRUCTION companies or front WINDOW DISPLAYS. Priced by the SQUARE INCH per decal. Price may increase due to the complexity of decal and the amount of labor involved in weeding out the excess material. All art subject to REVIEW. Installation, if applicable is $75.00 per hour. On site install $100.00 min. Specialty vinyl such as CHROME, REFLECTIVE, METALLICS is available, additional charges apply. Single color ONLY. Vinyl colors are limited, inquire within for available color options. Pantone color options available but not exact. 7 year premium cast vinyl permanent self-sticking. Price includes one standard color. Maximum size not to exceed 3 1/2″ x 6″. Minimum 5/16″ letters with 1/16″ stroke. 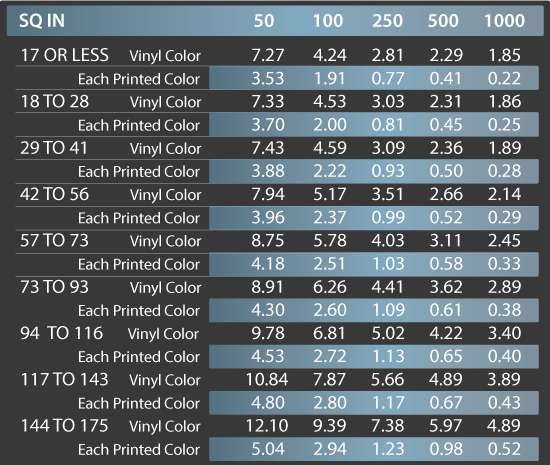 Vinyl Color Change: No charge in multiples of 125. 5-7 year calandered vinyl permanent self-sticking. Multicolor printed on white vinyl. Minimum 1/2″ letters with 1/8″ stroke. No cut out areas less than 3/64″. Color Change in multiples of 4.